After waiting for over a year, the big day has arrived. 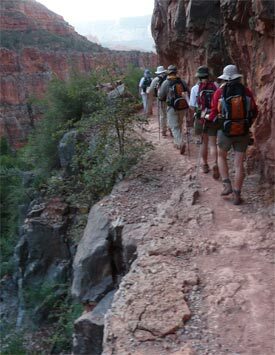 We are hiking from the North Rim to Phantom Ranch at the bottom of the Grand Canyon. Our hike begins at 4:47 a.m. at 45 F (7 C). wide, keeping Monica well away from the edge. "box" a couple of miles ahead of us. trail on the way to Phantom Ranch. "dogs" in the creek at Phantom Ranch. The first challenge was getting out of bed at the right time. We had all agreed that we wanted to be underway no later than 5 a.m., so the evening before we got everything packed up. A last minute alarm check and we were in bed. Monica, I, Ted and Darris were in one cabin, and the Fenchels in the other. After what seemed to be a very short night we heard Darris’ alarm go off and he was telling us it was time to get up. Only thing was, our clock said 2 a.m., not 4 a.m., which was the time agreed upon. Turns out his iPhone, which was his alarm clock, did not adjust properly to our time zone, so he was still on his time zone two hours earlier. So it was 4 a.m. back home in Indianapolis, but not in Arizona. After a good laugh we all got back into bed for another two hours rest. At a little after 4:30 a.m. we left our cabins for the parking lot and the one mile drive to the trail head. 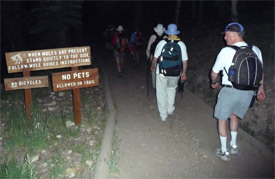 By the time we were assembled and ready to go it was 4:47 a.m. and the temperature was 45 F (7 C) at 8255 feet (2576 m). It was on the cool side, but on the first several hundred yards of the trail we walked through a few places where you could feel warm air. It got light fairly quickly, and by 5:15 a.m. it was already starting to lighten up noticeably. Two fellows had started down the trail a couple of minutes ahead of us, and we saw them later from a distance and then not again until Phantom Ranch. On the entire trail we only encountered 7 hikers, I think, either passing us or going the other way. 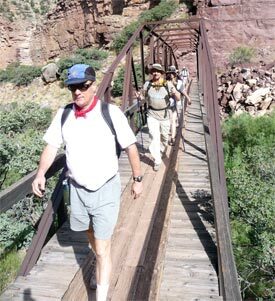 The trail from the North Rim to Phantom Ranch is not used as much as the trails from the South Rim. As we descended we walked "through" the layers of sediment we had learned about the day before during the geology lecture at the North Rim lodge. The hike was moderate in terms of difficulty. There were a number of switchbacks, and the hardest thing for me was the pressure on my knees from "braking" on most of my steps, since I was going downhill. The view was simply spectacular as you walked along. There were a couple of narrow places with quite a drop-off on one side of the trail, which got Monica over as close as possible to the upper side. We had three places where water was available. About a third of the way down we were at "Roaring Springs", a large natural spring that supplies Bright Angel Creek and also supplies water for the North Rim. From this point on we walked parallel to the creek and had the sound of rushing water constantly in our ears, and a couple of points where we crossed the creek provided a welcome opportunity to wet our hats and bandanas. By mid-morning we could already feel the heat. Our plan was to get to the entrance to the "box" by 11 a.m. 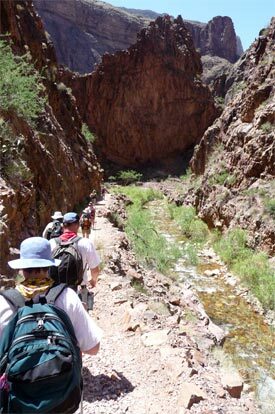 The "box" is a narrow passageway about two miles or so out from Phantom Ranch on the last leg of the hike. We were told that the afternoon temperatures there in the summer go well over 100 F, so everyone at the North Rim who heard about our plans told us to get through there by shortly after noon if we could. Our early departure and our good pace worked in our favor. We entered the "box" shortly after 11 a.m. Since the sun was not directly overhead, we had a number of places during this stretch where we walked in the shade of the eastern side of the narrow passageway. A couple of breaks for a drink, and a little after 12:30 p.m. we were out of the box and surprised to reach the entrance to Phantom Ranch just a few hundred yards further. We walked to the visitor’s center which also doubles as a lounge and the dining hall. 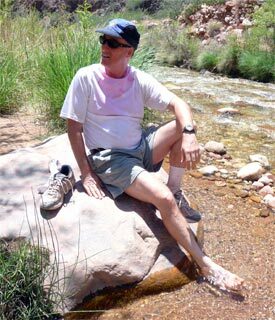 Phantom Ranch is about 2400 feet, so we had descended 5480 feet (1480 m) on our 14.5 mile (23.3 km) hike. We had our group cabin within just a few minutes as our hike coordinator Lisa checked us in. After that the first stop was the creek right behind the cabin, where we put our hot feet in the cool water. The air temperature was 106 F (41 C), so there was not only a height difference since we left in the morning, but also a big difference in temperature. For the rest of the afternoon we rested, took our showers and took a nap as well. We spent some time in the lounge/dining hall writing postcards – a novelty since Phantom Ranch is the only place in the United States where regular mail is still delivered by mule. Another highlight of the day was the steak dinner that evening. We gathered at the dining hall at 5 p.m. and were seated family style. The room was full with about 40 people. All the food we ate had been brought done from the South Rim by mule. And it was good, too! There was plenty of food, and when we were finished we were asked to leave promptly to allow the next group to eat at 6:30 p.m. – their meal was beef stew. After dinner we chatted a while and laughed at Lisa as Lynette and Garrett told tales about the start of their trip from Cincinnati, but everyone was ready for bed by around 8 p.m. We needed to get up early the next morning for breakfast at 5 a.m. and then a departure by 5:30 a.m. for the hike from Phantom Ranch up to the South Rim.